Toyota Motor Corp. on Tuesday announced that it halts sales of most of its popular models in the U.S. in response to growing concerns that possible defects may cause the vehicles to accelerate unintentionally. The Japanese car maker, which long has been viewed as the leader in automotive quality, said it told its dealers to stop selling eight models, including the Camry and Corolla sedans, two of the biggest sellers in the U.S. market. Other models affected by the move include the RAV4 and Highlander sport-utility vehicles and the Tundra pickup truck. Toyota also said it will stop producing the affected vehicles at several North American plants for one week starting Feb. 1. The company declined to say how long the sales suspension would last. The sales halt comes after growing reports of accelerator problems with Toyota vehicles. Safety Research and Strategies, a Massachusetts-based safety research firm, has identified 2,274 incidents of sudden unintended acceleration in Toyota vehicles causing 275 crashes and at least 18 fatalities since 1999. Mr. Michels declined to comment on the numbers. "I would say those data, based on the very diverse nature of his sources, are impossible to verify," he said. Until recently, Toyota had said it believed the problem mainly stemmed from floor mats getting jammed against the gas pedal, but later said its accelerator assembly's electronics could be a factor as well. 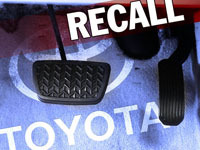 Toyota will expand its recall of vehicles with defective gas pedals to Europe. Toyota expects to recall roughly two million vehicles in Europe. Such a large and public quality problem is a big blow for Toyota, a company that last year passed General Motors Co. to become the world's largest auto maker by sales and for years due to its reputation for quality drew over customers from GM, Ford Motor Co. and Chrysler Group LLC. The sales halt also adds to the business troubles Toyota now faces. The deep downturn in U.S. auto sales in the past two years left the company with excess production capacity and idle workers—a situation more familiar to Detroit's Big Three. For the fiscal year ended March 31, 2009, Toyota reported a loss of $4.9 billion, its first loss in 59 years. The sales halt comes just as the U.S. auto market was showing signs of recovering. While the move is sure to ding Toyota's reputation, the company enjoys a deep pool of loyal customers built up over decades of making high-quality vehicles. Moreover, other car makers have overcome serious safety issues, such as Ford's problem with tires on its sport-utility vehicles in the 1990s that sometimes saw their treads separate, causing some of the SUVs to roll over. Toyota decided to halt sales of the vehicles "after weighing possible consequences of not suspending sales and production of those models and coming up with the ultimate remedy for the problem quickly," said a senior Toyota executive who did not want to be identified. "We were fully aware that short of this action we could be accused of selling lethal products," this executive said. Dealers said they still have vehicles with the defective accelerator pedal on their lots and the sales suspension stops those vehicles from being sold until a solution has been found.